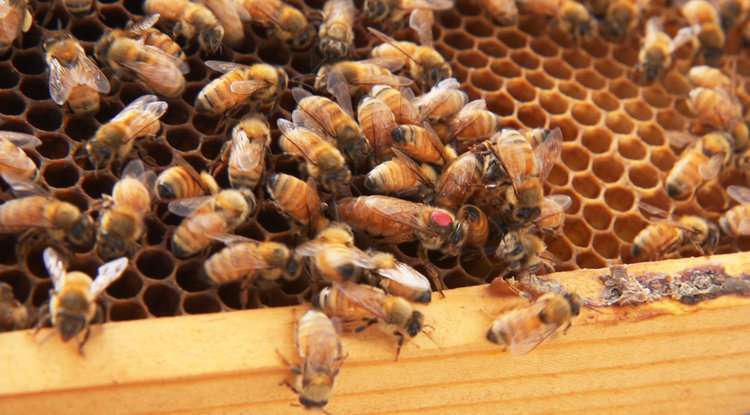 A team of researchers including three graduate students at the University of Arizona discovered that while worker bees and queens can be genetically identical, their vastly different lifespans appear to be connected to different microbes living in their guts. The observed differences in gut bacteria populations, called microbiomes, could be a clue in a mystery that has vexed scientists for a long time: In two genetically identical castes, why do worker bees die after mere weeks whereas queens can live years? "Our study is the first to suggest a connection between the bacteria that inhabit the bees' guts, the foods they eat, and physiological differences related to aging, stress and longevity," says Kirk Anderson, a research microbiologist with the Carl Hayden Bee Research Center in Tucson, Arizona. Anderson is also an adjunct scientist in the Department of Entomology and Center for Insect Science in the UA's College of Agriculture and Life Sciences. 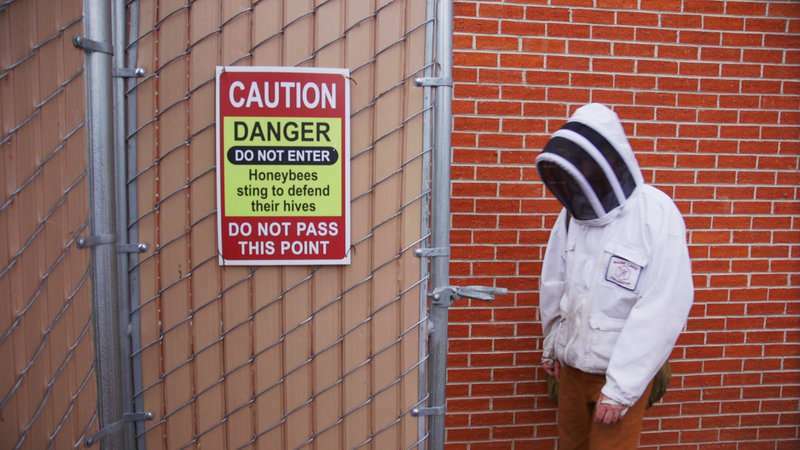 The study resulted from an interdisciplinary collaboration between the UA, the UA's BIO5 Institute and the Carl Hayden Bee Research Center, which is operated by the Agricultural Research Service of the U.S. Department of Agriculture. The group published their results earlier this month in the high-tier scientific journal Microbiome. Taking advantage of the UA's next-generation sequencing capabilities, Anderson's team identified the species and amounts of bacteria living in honey bee intestines. This allowed them to compare the bacteria that make up the gut flora in aging workers versus aging queens. A growing body of research suggests that in humans, so-called probiotic bacteria like Bifidobacterium and Lactobacillus are associated with health and longevity, whereas bacteria belonging to a group known as Proteobacteria often are associated with unhealthy microbial imbalances. There appears to be a similar trend in worker bees, leading the researchers to hope that bees could be used as model organisms to study the more complex assemblies of microbes that make up the microbiome in mammals, including humans. Similar to the physiology of aging, the researchers discovered that queen and worker bees embark on different microbial trajectories: as workers age, their gut microbiomes shift away from the initial dominance of beneficial, probiotic microbes, and their intestines are taken over more and more by bacteria associated with poor health and shorter life expectancy. Queens on the other hand, somehow manage to support a more refined, efficient microbiome, retaining "signatures of youth," as Anderson puts it. "The aging human gut goes through the same exact thing," he says. "Like the worker bee, it loses the probiotic species like Bifidobacterium and Lactobacillus and gains a variety of Proteobacteria, and those changes are intimately tied to our health." In recent years, interest in the roles of gut microbes has surged. Extensive research has been aimed at disentangling the complex metabolic pathways and interactions among the cells in our body and our microbial commensals and the myriad chemical compounds they produce and exchange. One such molecule is butyrate, one of many short-chain fatty acids produced by microbial fermentation of dietary fiber. Short-chain fatty acids are known to have important functions ranging from hormone production to the suppression of inflammation and possibly cancer. "Butyrate is produced in the hindguts of honey bees, via the co-metabolism of bacteria we found to deplete in aging workers and accumulate in aging queens," says Duan Copeland, a co-author and doctoral student in the UA's Department of Microbiology. "Both in honey bees and humans, butyrate is critical to gut health but also affects a broad variety of systemic health issues. It increases immunity and detoxification in bees, and it is known to influence core function in humans, including energy levels and behavior." "We assume that the presence of the probiotic bacteria is one component of longer life of the queen," says Patrick Maes, a fifth-year doctoral student in the Department of Entomology and Center for Insect Science at the UA. "The other is her much higher levels of vitellogenin, which remain high throughout her life. In workers, you'll see it peak early, then taper off within a few days." Vitellogenin is a nutrient storage molecule always abundant in the fat and blood of queens. More than simple nutrition, it acts as an antioxidant, improves immunity and suppresses inflammation. "Many of the gut microbes shared by humans and bees can be considered the same characters in a different play," Maes says. "Each harbor similar classes of bacteria. By looking at this simplified system, we can learn a lot about, and possibly augment, the human system." "The workers will feed her only royal jelly, which they produce in specialized glands. You can think of royal jelly as a type of super food, the bee's equivalent of breast milk, supporting beneficial bacteria and containing antimicrobial peptides." The study suggests that royal jelly, which enhances the growth of queen-specific gut microbes, sets the queen on a trajectory toward a much longer life by shifting her gut microbiome away from that of the common worker bee. Workers, on the other hand, rely mostly on pollen as their staple food. Royal jelly, honey and other factors in the hive environment keep unwanted microbes at bay, says Copeland. Bees can acquire their beneficial microbes by coming in contact with food stores, their nest mates and the overall environment in the hive. The researchers think honey bees could make an excellent model for human microbiome research, because of the striking similarities. While the human microbiome likely comprises thousands of bacterial species, the honey bee has only about a dozen, a much more manageable number to study. Conventionalized microbiomes, in which all microbes and all their genes are known, are already available for mice, and the same is being realized for honey bees. Such research, says Anderson, could help solve two of the big confounding factors in human microbiome studies: diet and longevity. "How and why do things get old and die?" he says. "These are fundamental processes that model systems help us explore, and the honey bee with its tractability and relatively simple microbiome could help us answer these questions."